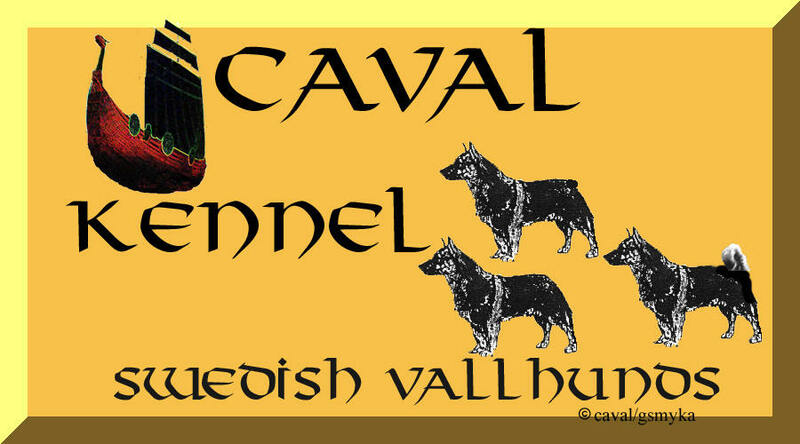 Welcome to the Wonderful World of the Swedish Vallhunds....and CAVAL Kennel in Particular. This is our second guest book because the first got too long to load after 850 entries. Please let others know about this wonderful breed...The SV is truly deserving of such recognition. Thank you for visiting. I have a dog that we found two years ago. She had hung out around my wife's store for 2-3 days in the pouring rain. Our first impressions were that we had a shepherd/corgi mix and the vet also said this. I had thought her "no tail" was the result of abus , but the vet said it was normal (a corgi feature). No one claimed her and she has been the best and smartest dog I ever owned. One day, I was looking through an encyclopedia of dog breeds and saw the Swedish Vallhund - short, no tail, and a shepherd-lik head. All the shaping matches my dog. I have gone on all the web sites I could find. Her shape, behavior, and temperament all match the Vall breed. The stumbling block for me was her color, which was basically white like a white shepherd. She's also pretty overweight. Then I saw Hurstfield's yellow sable Valls and my dog has gotten darker the past year (after a couple sheddings)to where her fur is more blonde than white and her hackles are brown when raised. She is about 14.5 inches at the shoulder and is extremely smart and loyal. I am pretty much convinced she may be a Vall, but my wife says I'm crazy and it's just wishful thinking. My fear now is that if she really is a Vall, she somehow came from somewhere and they would want her back or make e pay for her. Even if she isn't, I have come to love the breed and heartily support their acceptance. Am highly interested in Vals. Was disappointed I couldn't get through this web page - kept saying it has been "reset". Take care! As an owner of a British Hurstfield Vallhund it is always interesting to see others as the breed is still rare in the UK especially the northern parts of this country.It is usual to be asked what is your Corgi crossed with. This is no longer amusing as she is now nearly 9 years old! Am enjoying learning about this breed! Thank you! What a wonderful surprise finding your pages. I have been interested in SV's for a long time. I am very intested in finding out more about your dogs, and perhaps visiting them. How exciting! I have both kinds of corgis and an old lab. Wonderful site! I thorougly enjoyed your pages.I have two SV's in the shape of Hurstfield Norge Kim and Kitsam Laylas Viktor Sonn both gorgeous little dogs whom I'm completely besotted with.I have pictures a plenty but these would have to be sent 'snail mail! 'Details ple se. hi! i`ve got two swedish vallhunds, fennican zoja zostarella & fennican beela bengueela.i also think swedish vallhunds are great!! !i`m glad to know, that there are swedish vallhunds in america, too. greetings for swedish vallhunds all over the world! I'm intersted in learning all I can about this rare breed. Any information about SV's would be very helpful. Thanks! No Comment just want to aske something. Why Vallhund? Vastgotapets is the name i have leanrd during my studie fore judes. Please explan to me, with name is correct? al ready up front thank you! Hans. P.S. My wife and i our the proude owners of 5 Bassethounds and 1 Nova Scotia Duck Tolling Retriever. What a fabulous site - I shall carry on surfing the other links in a moment. I have 2 Swedish Vallhunds, brother and sister from the same litter, called Yann and Hope. They are 3 years old now and while they can still be little devils at times - I would not change them for the world!! They are wonderful and I could not recommend the breed highly enough. They make great companions and are loyal guard dogs. GO VALLHUNDS GO! I have been interested in these guys since I saw Cheryl at the shows in Soo, ONT. 3 years ago. You have a wonderful site, I love all the pictures. What is being done to have them recognized here in the U.S.? Do they like other dogs? Have you ever plac d one with a terrier breed? I've been in dog rescue for 22 years, in Pembroke Corgis/Corgi rescue for 15 yrs. and have been intrigued with the Vallhund. I should NOT visit these pages, as the pictures of such lovely dogs entice me further into the SV territory. These dogs remind me ery much of what the Pembroke should be(and sadly anymore) may not always turn out to be;a sturdy,energetic, sound herding dog. Could this dynamic, cold weather doggie make it in sunny So.Cal.?? Maybe so! Hello, I have 8 adults and 1 six months old puppy of this lovely breed, Swedish Vallhunds. Dogs of my breeding are living in Sweden 3, in France 3, in Holland 2 and in Slovenia 1 dog. I started breeding in 1989. There have been born 145 puppies since then in my home. Greetings from Finland to all SV- funs all over the world. Are any Vallhunds sold in Texas, Louisiana, Arkansas, or Oklahoma? I want to buy one. What a wonderful breed. Who ever shows them for you??? Somebody wonderful I bet. Nice page. Very informative. Keep it up. Am very interested in this breed. Have been searching for 1 1/2 years for the "right" dog and perhaps this is it. Interested in a female (not to breed.) Will contact you by phone since you are so close!!! Very nice site, very informative. Wish I had ound it a month ago, when maybe you would have had female pups. I am interested in purchasing a Swedish Vallhund. I currently have two Corgi Pembrokes and I would like to add a Swedish Vallhund. Your web page is very informative and the Swedish Vallhunds are beautiful. Love your page. I was a breeder in Australia for 5 years. Had a lot of sucess in the showring. I'm currently giving Leonie a hand with her dogs. When I was a kid, the family dog was a Welsh Corgi, whom we adored. My husband and I are looking for a "pet quality" dog for our household in an apartment in Seattle. Would a Vallhound be a good candidate? I'm 11 years old but allready I'm interested in showing. I just love Swedish Vallhunds! My family might get one when our resident dog dies. But what I mean is that we could consider it. Thanks it's been a pleasure talking to you! Sincerly, Sara U.
I am very interested in this dog. My daughter-in-law is also very interested in them. What is the cost for a puppy? How hard to train? We live in Boise Idaho, are there any close by that we could see? Do they work the front or the back of a animal? great to see your vallhunds, we have pem wel corgis! I am a happy owner of two puppets from the world most fameous border collie, and movie star TURBO. Please send me more information about your club, and in return we will send you a lot of interesting stuff about TURBO. Great to see the V�stg�taspets is spreading around the world! Hey! terveiset it�isest� Suomesta (FIN). Eip�muutakuinmenoksivaan. We are the proud owners of Olaf - who was born at Caval Kennel. I hope Cheryl Albert remembers us! Hi, here's a response from The Netherlands. We have about 250 Vallhunds in our country. We call them vastgotaspets (spets for short), wich is also in Dutch a difficult name. I have a swedish vallhund and a german shepherd. It is nice to hear that there ar vallhunds in the States too! Hallo everybody! What a nice suprise to learn that the Swedish Vallhund is known and breeded even in the US. It is a good and healthy breed, with strong herding insticts. Good Luck! I have a six years old male Vallhund, he is called Rasmus and is a wonderful family dog. He is calm in the house and quit tireless outside. A dog for the active family. Regards from Sweden/AC Hautala. Thanks Gail I enjoyed loking again. Thanks for the net sign. Jacqui. You are doing a great job for the breed well done lass. I am interested in purchasing a breeding pair if anyone can send me info it would be greatly appericated. Hi Cheryl, Rudy's puppies are growing well. Hope you liked their photos. Well try to call you tomorrow & have a chat hope you will be home. Leonie Dlarah Swedish Vallhunds Sydney Australia. Looking to purchase a SV sometime later this summer, perferrably a gray-sable female with the possiblity of purchasing a male also. Love your pictures!! Can you post the "old" guestbook, in case I missed something? I AM INTERESTED IN THE SWEDISH VALLHUND BREED FOR A PET, ANY BREEDERS IN SO. CAL?